The multidirectional “perfect paraxial” cloak bends light around the hand to show the grid on the wall. 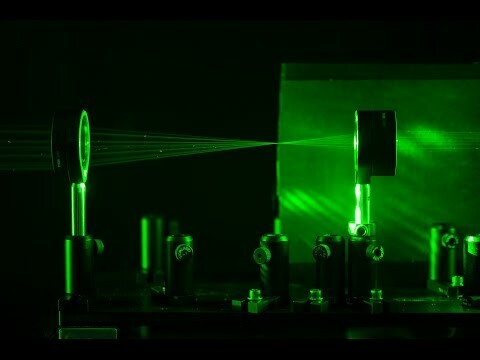 “This is the first device that we know of that can do three-dimensional, continuously multidirectional cloaking, which works for transmitting rays in the visible spectrum,” said doctoral student Joseph Choi. Other researchers have already developed 3D acoustic cloaks and Stanford research into optical metamaterials may yield more versatile invisibility cloaking, while the light-scattering approach of active invisibility cloaks could be easily defeated in practice. Choi and professor John Howell’s take on cloaking focuses on building an optical system that images the background. Their theory was that the technicalities of bending or reshaping light around an object in the foreground will be sorted as a natural by-product of accomplishing this background-imaging feat. They created a “perfect” paraxial (small-angle) cloak, which differs from a “perfect cloak” in that there are some visible edge effects at non-optimal viewing angles and that objects are entirely hidden within only a narrow range of angles. (The edge effects are reduced as the lenses get bigger.) They used matrix multiplication to calculate that a perfect paraxial cloak requires at least four lenses, with a theoretical viewing angle of up to 30 degrees, then tested the theory with three and four lens systems. Their setup provides a cloaked region in the shape of an elongated cylinder between the first and the last lens. Not quite everything in that region is cloaked, however, as the light is bent alternately into narrow and broad corridors through its center. To avoid blur and distortions in the observed image, they used achromatic doublets that combine two lenses as one. It’s certainly not going to enable invisibility cloaks like the one Harry Potter wears or the ones used in Star Trek, but Choi and Howell’s device is more than just a variation on the classic magician’s trick (which uses carefully-placed mirrors). It can be scaled up or down to fit any cloaking size (on the condition that you can find lenses of appropriate length and curvature), and that opens it up to some novel applications in real life. Just don’t go thinking it’ll keep you hidden in a room while people spill secrets about how your parents were betrayed and killed by an evil magician; we’ll have to keep waiting for that one. A paper describing the system was published in the journal Optics Express, and you can see it in action in the video below.